It’s now easier than ever to launch a denial of service (DDoS) attack. You no longer need advanced technical skills to disrupt a service or make it unavailable. Anti-DDoS protection, like the one that VL developed in 2010, can limit the scope of such malicious attacks, which are growing in frequency and severity (in 2016, one-terabit-per-second attacks were recorded for the first time). The gaming and e-sports industries are particularly prone to DDoS attacks and the protective measures implemented by service providers show their limitations when faced with the intensity and frequency of these attacks. Especially those which exploit UDP, a connectionless networking protocol used by most game and voice servers. VL therefore felt it necessary to develop anti-DDoS protection specifically adapted to game servers. Clément Sciascia, an VL developer, provides more details. 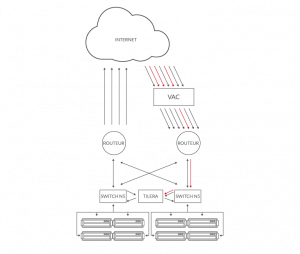 As the diagram shows, a Tilera box, situated close to the server, inspects TCP/IP and UDP packets, initiates mitigation and can act as a cache to lighten the load on the machine under attack when it is difficult to filter illegitimate packets from legitimate packets. In the event of a “traditional” attack, i.e. when the VAC knows how to mitigate, the Tilera device guarantees protection until the VAC is activated and takes over. In addition, as the Tilera is placed as close to the server as possible (at the same level as the switches), the protection works even when the attack comes from within the VL network itself. In these cases, the mitigation filters the attack until the machines located in VL that caused the attack are identified and suspended.